And, does anyone, really? (With the exception of film critics or anyone who works at Premiere or EW magazines.) There are some locks, sure (see: Helen Mirren for Best Actress), but how is any layperson supposed to discern whether the Academy will favor Pirates of the Caribbean: Dead Man's Chest or Apocalypto for Best Achievement in Sound Editing? (P.S. I went with Pirates. The Academy can't totally ignore the blockbuster, and I think there's no way Mel Gibson is going to win anything, based solely on my "he craaaazy" theory.) I even went to see the short live films at IFC this year, and I don't feel much more informed than before. But, down at the bottom of my ballot, there was something tiny and awesome. Waaay down in the Best Achievement in Makeup Category, there was the name of a very bad movie: Click, starring Adam Sandler. Yes, that Click. And something about that made me really, really happy. The nominees, Kazuhiro Tsuji and Bill Corso, have some serious makeup work under their belts, particularly Corso. I mean, this guy was "Ape Makeup Artist" for the remake of Planet of the Apes, and he's already won an Oscar for his work on the Lemony Snicket movie. I just like to think about Tsuji and Corso getting up in the morning to go to the set of Click and thinking, "Dear God, how low have I sunk?" And then, months later, they hear they've been nominated, and they feel justice has now been served after the indignity that was watching Adam Sandler's unfunny antics for weeks on end. I imagine them clinking wine glasses filled with a $15-a-glass Bordeaux in front of a ski lodge fireplace and saying "Well done" to each other. That fictional scenario amuses me to no end. 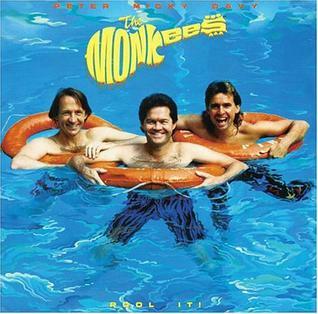 *For those of you who didn't know, this is the title of The Monkees' first reunion album, which came out in 1987 and included such songs as "She's Movin' In With Rico." It was not good. The other Monkees reunion album? That was called "Justus" and featured fourth band member Mike Nesmith as well as the other three. I have never heard that one. I was actually, cryptically, asking where Nesmith was on the cover; but, you've answered the question by saying, by implication. that he wasn't on this one. Ah, "Last Train to Clarksville," an unappreciated classic. Oh, man, that's a good song. It's actually about a young guy going off to Vietnam and trying to squeeze in one last date with his lady.